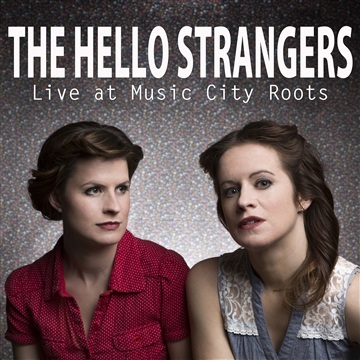 The Hello Strangers just released their first full-length, self-titled album with multi-award winning (Grammy, Emmy, Dove, Tele) IMI Records in Nashville, Tennessee. The album features 11 originals and 2 covers, including "What You Don't Know," written by, and featuring on vocals, Jim Lauderdale; and "Que Sera, Sera," an homage to their grandfather, Ronald Chace, who sang with Doris Day. In 2012, Larissa and Brechyn won AirPlay Direct's "Win An Americana Record Deal" contest, giving them the opportunity to work with Steve Ivey of IMI, and a host of other talented industry professionals, on their 2014 album. The Hello Strangers were born out of the Austin, Texas music scene in 2006 when the sisters wrote their first song together, entitled “Pregnant in Jail.” Based on true events, it was a preamble to a string of original tunes the pair crafted in a little cottage off South Congress Avenue. Soon, however, the mountains of Pennsylvania beckoned the girls back north, and so they packed up their lives, dogs, and Larissa’s husband and returned to their two-stoplight hometown. The move has since proven to be a boon for the duo. The sisters have created a catalogue of original music with nods to American folk traditions, modern indie rock, Texas country-folk, and roots rock, all tied together with lilting harmonies that only sisters can create. Timeless imagery and fables are at the core of each song, from tales of a boggy creek bottom where a murdered man sleeps, to a Texas roadhouse with bawdy dancers and clinking beer bottles, to more poignant reflections on the loss of winter or a man gone wrong.